Humans today throw words around with absolutely no idea how to pronounce them or what they mean yet by using them incorrectly long enough, the words themselves become changed. Take the word “forte” for instance. It’s pronounced “fort,” people, not “for-tay,” “FORT.” Really. Look it up. But people have been screwing it up for so long that even the dictionary finally gave up. I know, you are gong to tell me that language is elastic and that it evolves. I’m just asking, must it evolve to accommodate stupidity? Apparently so. Additional examples of this exist here in my home state of Indiana. Right now, for instance, I am temporarily staying in the Middle of Nowhere, Indiana which is a mere half hour from Milan, Indiana. That’s pronounced “My-land,” for those of you who, when you first read the word, foolishly thought to yourselves, “Me-lawn”. I feel confident in saying that most of the people who live in Milan, Indiana cannot even conceive of Milan, Italy, of what it has produced and the place it holds in history. I’m equally confident that these humans have no idea why the Travel Channel or the Discovery channel is included in their cable package. If you can’t watch the Bengals on it and scream “Who dey” at the television, what’s the point? I’m also just a hop, skip and a jump (times a million), or about a half hour, from Versailles, Indiana. Of course, that would be “Ver-sales.” Stop laughing. I’m not making this stuff up. They look at you like you are an idiot if you say it any other way. So, apparently, in keeping with the parlance of the day, I’m a Muslim. This is obvious because I AM a terrorist. Just ask anyone. I box ankles without reservation, take it upon myself to destroy anything in my purview with which I disagree and generally rain fear down all around me. At least, that’s my goal. It was easier when I still had my front teeth. (Damn those abscesses.) I also fully support the terrorist actions of others. 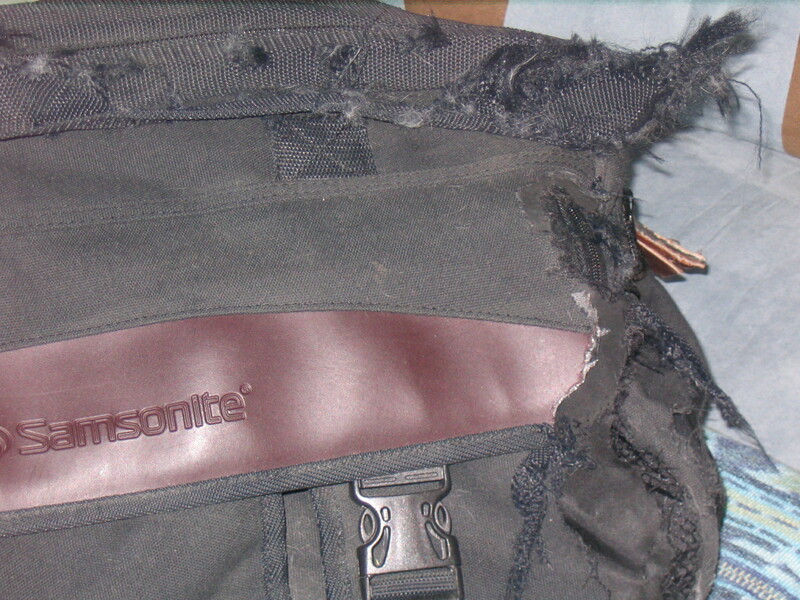 Earlier this week Samwise Bunny chewed a huge hole into the side of a Samsonite carry-on and ate right through the handle. I was impressed. Just like al Jazera, I’m posting this photo on my site. I say, “chyron shmyron!” because in addition to being a Muslim, I am not qualified to be the President of the United States. You see, I don’t wear my birth certificate on my forehead and my mother was an ENGLISH lop so, clearly, despite the wealth of evidence associated with my domestic birth, including the testimony of several humans who were present, my thrice verified birth certificate and local newspapers of the day which noted my birth, I am still considered foreign-born by a full 30% of the population. I am even further unqualified to be President because you don’t think you would want to have a beer with me. You think I’m too smart, too educated and not at all like you and we all know how qualified YOU are to be President. OBVIOUSLY, when you compare the essential requirement of beer-buddy to the frivolous extravagance of intelligence and education, there is no question what-so-ever that I am not Presidential material. Since I don’t have a chalkboard, here’s a handy chart. But let’s be clear here, I AM a terrorist. “No!” you say? You don’t know me. I’m THAT disapproving*. *See previous post references to me as a Famous Disapproving Rabbit. That Indiana town is pronounced ‘verse-a-lease’. What about Edinburgh? I feel like an idiot no matter what I call it. Living in Seymour I seemed to drive past it daily. It was a rough time for me (and was also when I acquired Arliss, who must still be resenting that southern Hoosier time). I have stopped using the word forte precisely because I cannot bring myself to say it wrong, but everyone thinks I’m an idiot when I say it right. I remember the last time I said it for-tay: ninth grade, when my teacher told me it was fort, and I’ve never forgotten.